Will You Cut Up Your Comics for Valiant’s Harbinger Wars 2 #0? Home » Comics » Will You Cut Up Your Comics for Valiant’s Harbinger Wars 2 #0? In a pre-arranged interview today at CBR, Valiant’s Dinesh Shamdasani and Warren Simons dived deeper into the recently revealed plans to lead November’s Harbinger Renegades series directly into a Harbinger Wars 2 event, conveniently timed to arrive near the Harbinger feature film in 2018. As a tribute to the classic “Harbinger” #0 from back in the day, we’re making this special prelude chapter available only through a series of mail-away coupons that will be included in “Harbinger Renegade” #1-4, which can be redeemed for a copy of “Harbinger Wars 2” #0 at a later date. 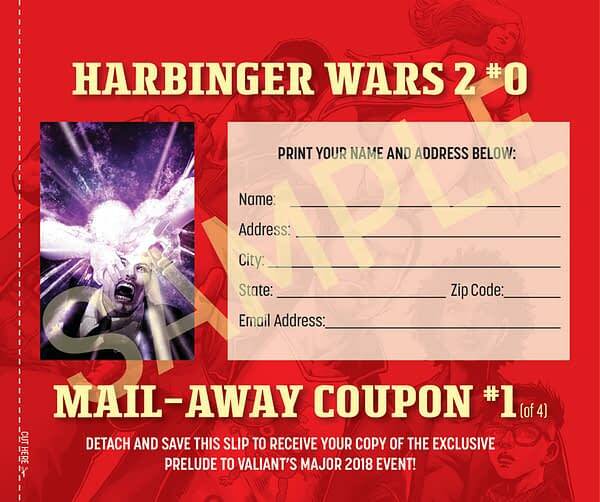 Fans can collect and mail away all four coupons to receive an exclusive prelude issue that won’t be found anywhere else until the final hardcover collection of “Harbinger Wars 2” in late 2018. So the question is…could you you be tempted to cut up your Valiant comics for a first taste of their 2018 event? Harbinger Renegade #1 is on sale November 16th from Valiant Entertainment. Are You Coming Up To Thought Bubble Tomorrow? Kieron Gillen Needs You!